good trader, he agreed to my terms, let me go first and was pretty damn cool about the trade. +REP, fast and friendly trader!!! Smooth, fast and easy trade. +rep. Easy trade, good and nice trader. 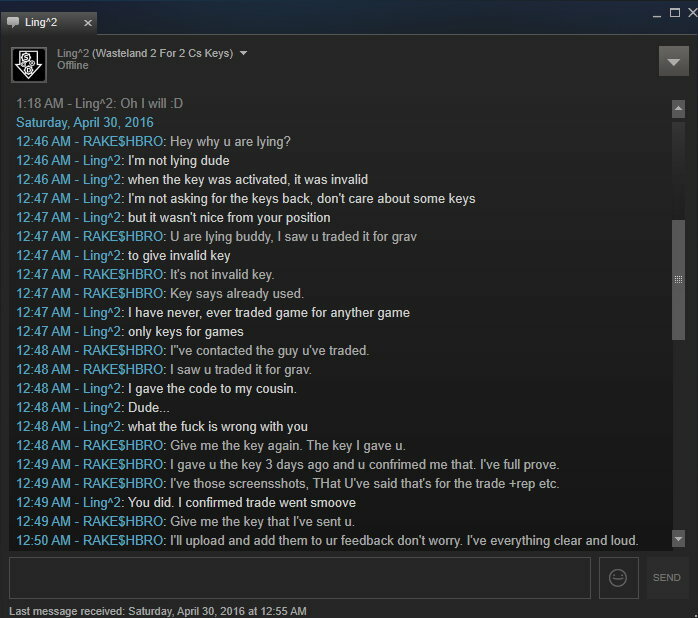 A very smooth transaction (he swapped a key for a Humble link). Thanks! +rep Great Trader ! Thanks for the trade! +rep Fast, honest and reliable trader! He went first with CSGO keys! smooth trade, my gift for their key, in trade window. 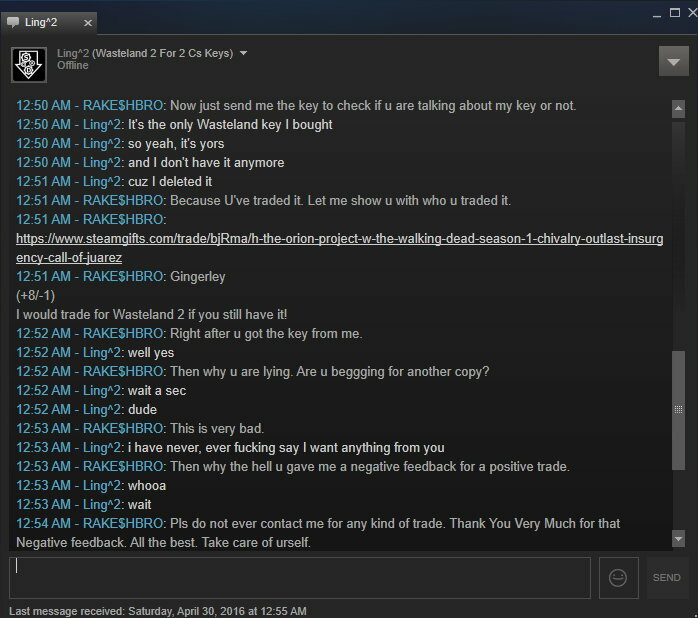 I traded my Wasteland 2 Game Key with him 3 days ago, After I send him the code, He said everything positive, I do have the screenshots, And I think he traded the code already with someone that day. Now trying to be greedy and saying "Sold invalid key.". 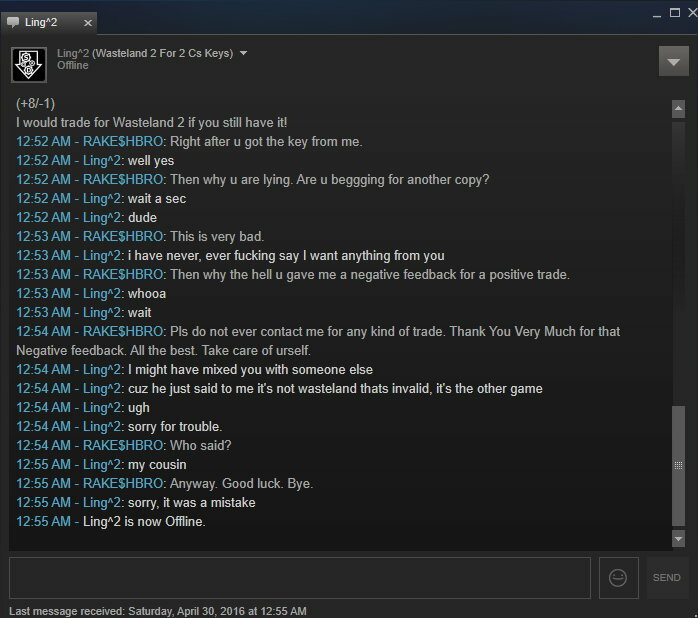 Be careful trading with this guy. You've almost proven that I've scammed you. I'll rather get scammed instead of scamming someone. Anyway. No Need to be sorry. Human Makes Mistake. And Good Human Forgives. Take care.